The Morning Mist Springs, located at the western trailhead of the Mary Mountain Trail, do not include spectacular geysers or exceptionally beautiful hot springs, but they gained some notoriety, though. However, the reasons are more of a bloodcurdling nature. 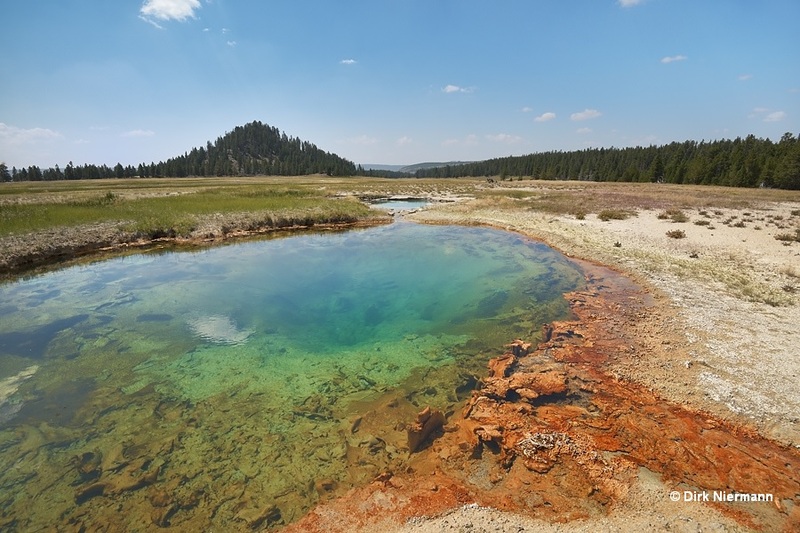 The group is home of the one hot spring in Yellowstone that killed more people than any other. Those victims didn't come to meet their demise, but to take a dip in one of the medium tempered hot springs, which was as illegal in the past as it is nowadays. Their desired destination was the spring LCBNN161, located close to a fishermen's path running in parallel to the Mary Mountain Trail along Nez Perce Creek's south rim. Lee H. Whittlesey researched deeply into the tragic incidents and published the detailed stories in his book Death in Yellowstone. The first fatality occurred close to midnight on July 12th, 1967, when a 20-year-old park employee from New York hiked together with his 18-year-old friend to the at that time unnamed spring LCBNN161 to go swimming. Although the action was an illegal one, they might have seen no risk in it because the targeted pool used to exhibit temperatures between 35 °C and 50 °C (95 - 122 °F). What they didn’t heed was the fact that the spring is actually consisting of two basins, only separated by a few feet wide ribbon of dry ground, which is cut through by a runoff channel. Somehow the 20-year-old got into the wrong basin where 82 °C (180 °F) hot water scalded more than 90 % of his skin. The immediate help of his friend to get out of the pool could not save his life, and he died after 12 days in a hospital. 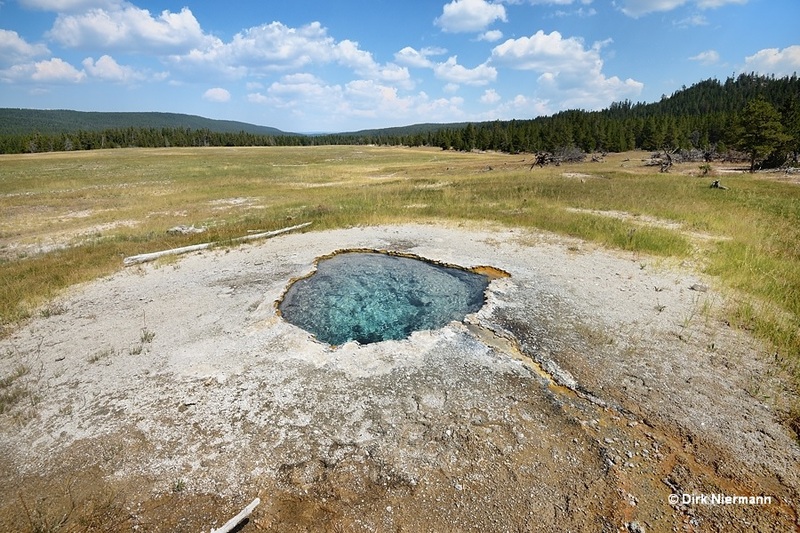 Later geologists of the USGS officially named the pair of pools Dead Savage Spring (the term "savage" was used in Yellowstone for park concessioner employees) after a second fatality also fit into this scheme. Eight years later, on June 30th, 1975, once more illegal "hot potting" led to the death of a young man. This time a 20-year-old park employee from Washington State was the victim. Together with a larger group of fellow employees he visited the same spring LCBNN161 at night as the two men in 1967. It still remains unclear how the Washington man got into the hot basin of Dead Savage Spring and why nobody in the group took notice of the incident. Fact is that the group left without him and, allegedly, also without missing him. Not until three days later the young child of a fisherman chanced upon the already to a great extent disintegrated body inside Dead Savage Spring. Besides Dead Savage Spring the Morning Mist Springs encompass a huge number of further hot springs, but most of them are small, inconspicuous and not accessible by trails. 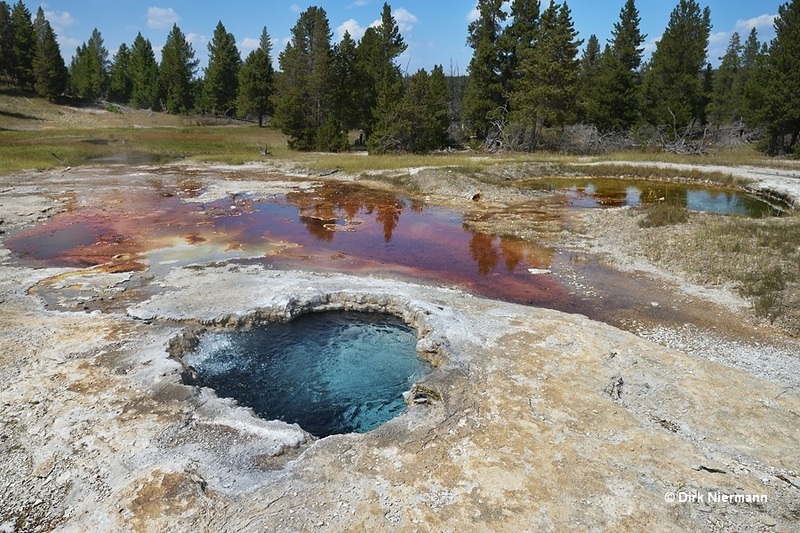 An exception is the attractive Porcupine Hill Geyser, which lies, as the name suggests, at the eastern foot of the northernmost Porcupine Hill. 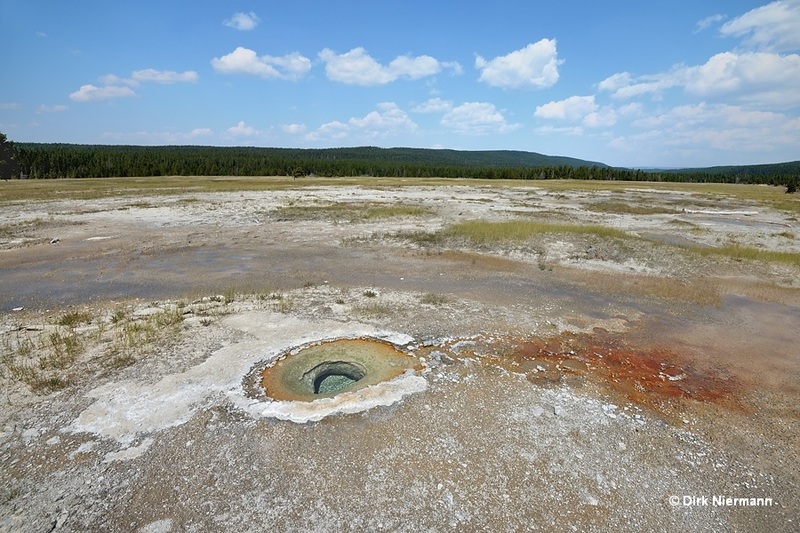 Probably it would never have been a geyser by nature because it started its eruptive activity not until the USGS executed a scientific drilling experiment in close vicinity in 1969. However, eruptions of Porcupine Hill Geyser are very rare. 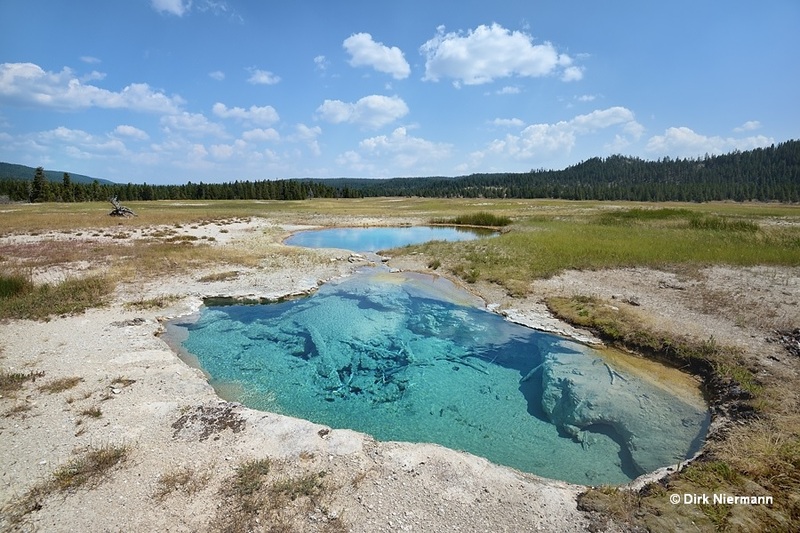 There are only a few other springs of the group which are worthwhile to mention and which can be spotted from the Mary Mountain Trail or from a smaller, well recognizable path running through the meadow in parallel to the Mary Mountain Trail. Two examples are shown below. The second example emerges from a flat, symmetrical cone, indicating rather high temperatures by its clear blue water. In this case I was unable to find a corresponding entry in the RCN Database.